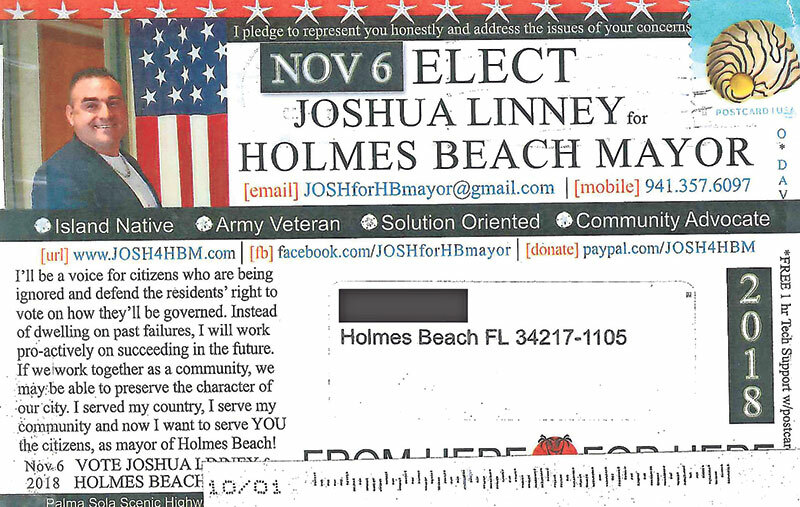 Holmes Beach mayoral candidate Joshua Linney mailed postcards to residents Oct. 1 asking for their vote. Included in the pre-election postcard are typical candidate promises, vowing to serve and be a voice for citizens. 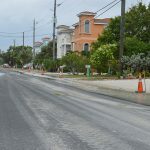 Holmes Beach Police Chief Bill Tokajer wondered about the legality of the postcard promise and passed it along to city clerk Stacey Johnston, the city’s top election official. Johnston checked with Manatee County Elections chief deputy Sharon Stief, who replied to Johnston in an Oct. 11 email, citing the state statute prohibiting vote buying. “In regards to the statement on the postcard, Florida Statute 104.061(2) states ‘No person shall directly or indirectly give or promise anything of value to another intending thereby to buy that person or another’s vote,’” Stief wrote. According to Linney, he is a website designer with a digital media degree from the University of Central Florida who serves the community as an IT technician. Asked whether the postcard mailing ran afoul of the vote-buying prohibition, Sarah Revel, the state’s communication director, said she could not make a legal determination and advised consulting an attorney. In Trushin v. State, a 1982 Florida Supreme Court decision upheld the constitutionality of the statute against vote buying as well as Theodore Trushin’s conviction under it. Florida campaign election law provides a method to complain about candidates and their campaigns.